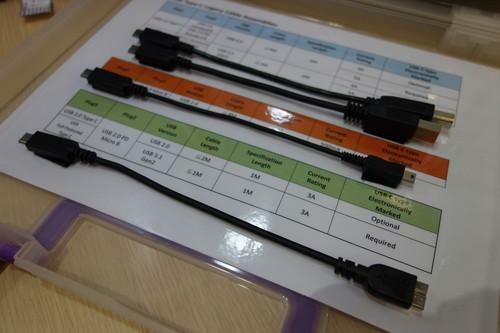 USB Type-C adapter cables shown at Computex. In March, Apple was among the first to come out with a laptop built with a single USB 3.1 port that used the Type-C connector. The USB 3.1 standard promises data transfer speeds of 10Gbps (gigabits per second), two times faster than USB 3.0. But given that the technology is still new, prices for USB 3.1 cables with Type-C connectors are hovering between US$24 and $29. More affordable cables, however, will start to arrive in next year's first half, said Lake Chang, a general manager with Wanshih Electronic, a maker of USB connectors. On Tuesday, the company was showing off its latest USB cables at the Computex trade show in Taipei. "By next year, the prices could fall to $15," he added. KaiJet Technology International, another maker of USB connectors at Computex, also expects prices to drop, but sooner and in this year's fourth quarter. The company plans to offer USB 3.1 Type-C cables at $24.99 in July. Overall, the PC industry is moving to the USB Type-C connector, which does away with the older USB ports in favor of new reversible cables. But even with Type-C adoption expected to take off this year, some PC vendors might be reluctant to include the faster USB 3.1 standard in some of their newest products. On Monday, Asus showed an all-in-one, called the Zen AiO, which uses a USB 3.1 Type-C connector. But the Taiwanese vendor also unveiled an Android tablet built with a slower USB 3.0 Type-C port. The USB 3.1 ports still cost more to manufacture, so vendors may hold off until the technology matures, Chang said. His company is, however, preparing to build USB Type-C adapters and cables for PC vendors, which will be available in the coming months. "In the second half of this year, we expect to see big demand for Type-C adapters and cable lines," he added.